When a woman experiences pain and cramping during her menstrual cycle, there are numerous gynecologic conditions that can be to blame. One of these conditions is endometriosis, a top-three cause of infertility in women. Approximately 5.5 million of North American women suffer from this disease and 30 to 40 percent are infertile. Endometriosis occurs when cells from the lining of the uterus (endometrium) grow in other parts of the body, causing pain and scarring. Endometriosis most often grows on or around the ovaries, behind or around the uterus, or on the bowels or bladder. In rare cases, it can grow in the lungs or other parts of the body. 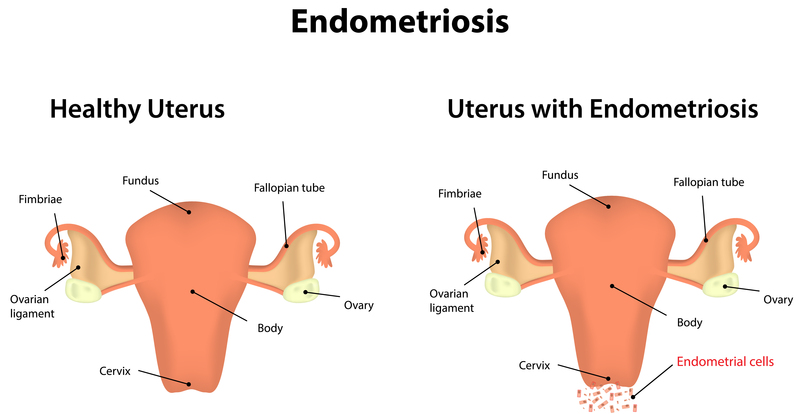 Endometriosis develops over time and can be masked by birth control pills or pregnancy. It is often discovered when a patient sees her doctor for pelvic pain, menstrual cramps or infertility. It can also be found incidentally during surgery for another condition. To complicate matters, some women with endometriosis experience no symptoms at all. The severity of symptoms has no correlation with the severity of the disease. The degree of endometriosis doesn’t correlate with the pain someone has. A woman can have minimal pain with severe disease and vice versa. It depends where it implants. Endometriosis cannot be cured, but it can be managed. Pain associated with endometriosis can be relieved with regular exercise and relaxation techniques, as well as over-the-counter or prescription anti-inflammatory medications. To prevent endometriosis from worsening, hormone medications (such as birth control pills) can be used for treatment. Surgery can remove areas of endometriosis. Some women don’t need to do anything if they don’t have symptoms. It really depends on your child-bearing preferences. If a woman is trying to get pregnant, she can keep trying. If she is having terrible pain and doesn’t want to have children, we can use Lupron, an injected drug that helps ‘burn out’ areas of endometriosis. It is done for people with the significant adhesive disease, which can cause scarring. Even after treatment, endometriosis can return. Though it is a chronic disease, it often resolves itself during menopause. In severe cases, endometriosis cause scarring in the pelvis and occlusion in the fallopian tubes, leading to infertility. If a woman has difficulty becoming pregnant, surgery to remove areas of endometriosis may improve her chances of conceiving. If this does not help, fertility treatments may be recommended. Long-term complications include pelvic pain that interferes with everyday activities, pelvic cysts that can rupture, and blockages in the urinary or gastrointestinal tracts. Pelvic pain, endometriosis, and infertility are all able to be treated. But they require a proper diagnosis to move forward. If you are experiencing any of these conditions, or if you are having trouble becoming pregnant consider scheduling an appointment with one of the provider’s in our office. To read more about our providers, click here.